Errol: I was out playing LA Noire with Manda, and then this name popped into my head so I grabbed Manda’s phone and started texting Debs. I do admit, I have a hard time texting on Manda’s phone because I can never find the text app. It’s a blackberry, and they confuse me. And then I get confused because the enter is the send, which is right below the delete key, so I accidentally sent Debs three texts trying to get it straight. Of course, Debs never texts me back because she only has limited texting and gets mad at me for filling up all the memory on her phone. Manda probably wonders why I’m always on her phone. 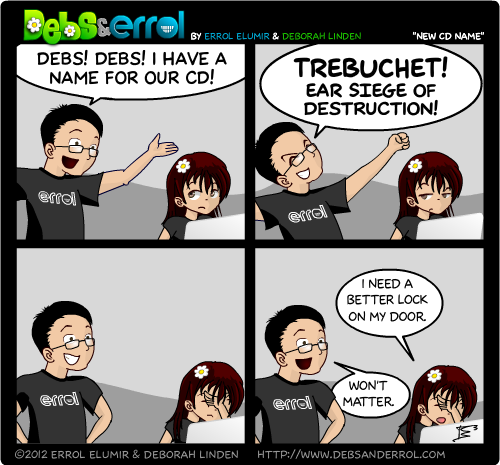 Debs: Hey, you only said “Trebuchet”. “Ear Siege of Destruction” has some potential…I still like “Debs & Errol vs. The Purple-Horned Majestic Narwhal” or some such. Errol: Ooooh! “Debs & Errol vs the Ear Siege of DESTRUCTION” Why would we go up against the Narwhal? I would join it. Debs: Well, because then each CD we put out would be vs something else random! I kind of like “Songs in the Key of Geek”. Sigh. At this rate we’ll probably just call it “Debs & Errol”. @Errol, Then have it be Need an album title? Why not Zoidberg? CENSORED BY SOPA Then it’s not a copyright violation, and it’s making fun of copyright violations! The image of using one’s songs as ammunition and flinging them at a potential audience has a strange attraction. Debs reaction here is identical to my reaction to “Eye of the Tiger”. I love Errol’s expression in this comic. It’s more enthusiastic than usual. And I never knew he could be more enthusiastic. I don’t actually understand the title, though…. Shouldn’t there be a glossary for people who aren’t geeky? @Lizette Tanner, The title of the comic is “New CD Name” because we’re talking about the CD. @Errol, I think she meant the Trebuchet part. Still, who doesn’t know what a trebuchet is? @Errol, Yes, yes he does. @Lizette Tanner, It’s his job. I agree with Lizette. Perhaps call is something like Songs in the key of Geek. First I saw the comic and was about to comment “What Errol doesn’t mention is that this conversation happened on my phone, which I discovered this morning” but then you went and explained it. So I guess I’m not interesting enough to hang out with because Errol texts his more interesting friends :P.
@Manda, You’re killing me Manda. You just wait until the next game review we do. YOU JUST WAIT! Errol steals people’s sanity (and texts from their phones). Not that I want to disagree with Lizette…but I thought Debs suggested “Songs in the Key of Geek?” Which I admit, I kind of like. I also agree with Debs. Songs in the key of geek sounds awesome!